Rings fall in garbage disposals. I know it seems like a death sentence for your ring, but it may not be. 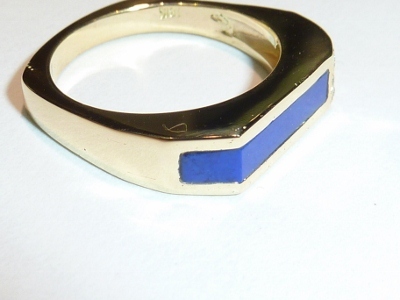 In this blog I focus on Stephanie’s ring because it talks about damaged metal and inlay, a real double whammy. I’ve run into about 25 clients who’ve had rings go down the garbage disposal. So I decided to blog about this success story. I also have added a couple more examples. Stephanie was just wondering where her lapis ring was when she heard the garbage disposal turn on and heard the horrible sound of a spoon or something grinding in it. This was the story she told me, when I asked if she had any unworking or unwearable jewelry in her jewelry box. “Turn that off!” she had yelled to her husband. Like the crazy insane brave guy that he was, he just reached in and started feeling around in the disposal. Hadn’t he ever seen the horror movies with the guy who ends up with a stump for reaching into the possessed garbage disposal? Evidently not. Out his hand came with one very sorry looking ring. Stephanie now remembered taking off her ring the day before, when scrubbing out her big pasta pot. “Oh no. 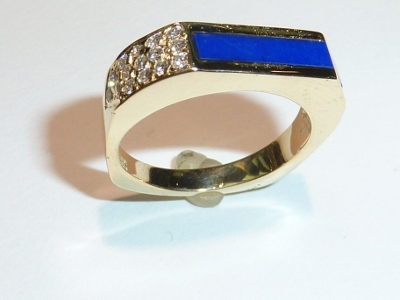 I loved that ring.” She rinsed it off and dried it and put it sadly into her jewelry box. Stephanie thought it was hopeless to consider that it could be fixed. I really wanted to fix this ring for her. 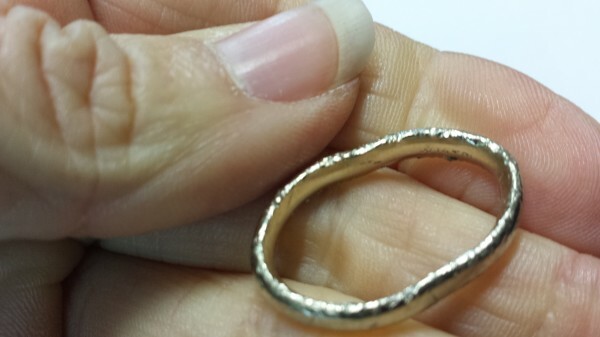 We added gold to the gouged edges of Stephanie’s ring. Then I had my Lapidary (stone and gem cutters) cut a new piece of Lapis Lazuli for her newly rebuilt inlay setting. I will never question how it happens that someone’s ring falls into a garbage disposal. Rings fall into all kinds of places. Miana’s wide beauty of a ring just had to join the party on this post to show how a ring that looks, ‘just done’ can live again. The work we did was: re-rounding, adding gold to deep divots, re-polishing and then adding oxidation. When someone wears a ring daily, having it get messed up like this is traumatic. 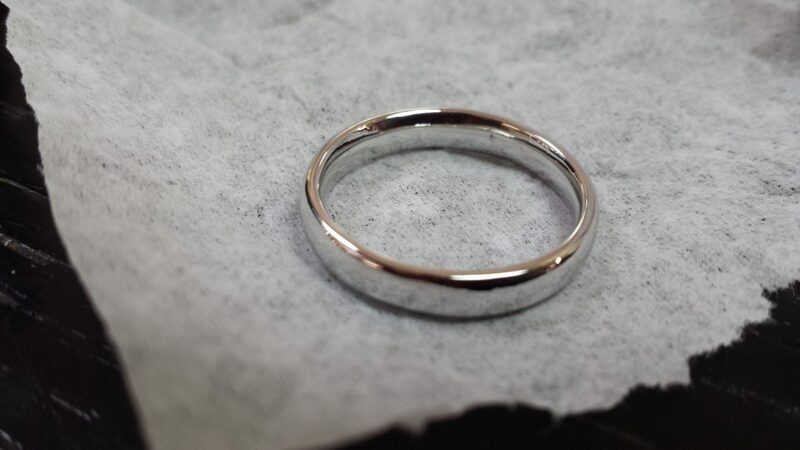 My favorite thing about working on garbage-disposaled rings is how happy people are when it’s fixed. What Happens to Gemstones in Garbage Disposals? Jason Deshotels a jeweler friend just got this poor ring in. As you can see the metal takes a huge beating. Interestingly the diamond though slightly chipped came through amazingly well. I have seen this more than once, where other colored gemstones will be pulverized and the diamonds bounce around, but don’t get destroyed. Do you have a ring that’s been through a garbage disposal? Now you know who to call for inlay ring repair. Or chewed up ring repair. Like body work on your car after a crash, I do body work for your jewelry! Peter found me online thanks to this blog post. Peter’s Ring After Repairs. Bit of a Difference, eh? “I emailed you from my home in Maryland and you responded quickly and I ended up sending my bent, mangled and dinged garbage disposalled ring to you. That ring means a lot to me. My wife and I paid for matching rings with a box of rolled coins we had saved over the years in graduate school. I didn’t want a new ring-I WANTED THAT RING! Hello Calla Gold Jewelry, I laughed when I saw this. My ring fell in the garbage disposal five years ago. It’s in my jewelry box with with earrings that I stepped on in my driveway. Should I ship these hopeless wrecks to you? I was told in Clarksville that I should buy a new ring, which I did and to give up on the earrings. Calla, you’ve made me feel like it wasn’t idiotic to hang on to these two pieces of beloved and bedeviled jewelry. I guess the old saying is “never give up on a ring you love.” Personal jeweler to the rescue-or-should I say-Calla Gold – Super Jeweler Woman? Good job fixing that inlay ring repair. That ring turned out absolutely gorgeous. Did you have to re-set all the diamonds? It looks perfect. I can’t imagine that the diamonds or the settings were in very good shape. The amazing thing is how beautiful that ring is!! How sad it would have been had Stephanie never connected with you! I hope that many others are inspired to pull out their damaged jewels and send them your way for some magic! Calla Gold, I’m really impressed with your writing talents and also with the layout for your blog. Is this a paid for blog or did you customize it your self? I love the jewelry into the garbage disposal since I’m in garbage disposal reviewing. 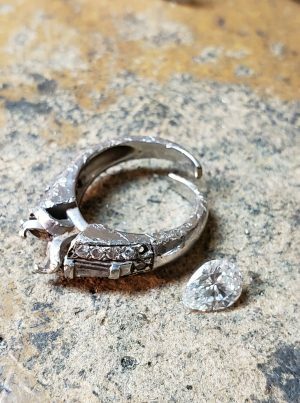 Anyway keep up the excellent quality writing, it’s rare to see a great weblog like this one today..
I’m in Texas and was wondering what was shipping costs and costs to fix my wedding ring that went i to the disposal. Two diamonds are missing and would have to buy new ones. Wow, it looks good as new – maybe even better than it looked before it got all chewed up! If I had a ring that looked like that I would’ve thought it was a lost cause. You guys are basically miracle workers!